These wretched soles, whose task it was to lay depots for Shackleton’s advancing party, were stranded for two full years before the survivors were finally rescued. After his own rescue and on learning of their plight, Shackleton was moved to write; "without parallel in the annals of polar exploration...a task almost beyond human endurance." Shackleton’s Imperial Trans-Antarctic Expedition of 1914 was divided into two parties – The Weddell Sea Party, commanded by Shackleton himself and the Ross Sea Part, commanded by Capt. Aeneas Mackintosh. He had served with Shackleton aboard the Nimrod in 1907 and earned his leader’s respect as a gutsy, determined seaman of rare quality. The Ross Sea Party arrived in January of 1915 aboard the Aurora, already a well-worn vessel, and immediately set about laying stores as instructed by Shackleton. When the first team struggled back to base in March without a single dog left, they found Aurora had been blown out to sea in a storm and perhaps lost forever. Aurora’s stores had not been fully unloaded and the men were severely depleted, but resolved to complete their mission at all cost. In October nine men set off again in parties of three with their four remaining dogs on a planned five-month sledge, this time needing to lay caches all the way to 83 degrees 37 minutes south. Feeding their urgency was the thought Shackleton’s party might be racing for those supply depots. They had no way of knowing Shackleton and his crew would abandon the Endurance at the end of that month. Once again they were overloaded and at times covered the same ground as many as 14 times. On Jan. 4, one of the stoves salvaged from Scott’s hut failed and three men were sent back with it. Another stove failed after leaving a depot at 82 degrees south, forcing the remaining six men to continue together. Near the end of January two men showed obvious signs of scurvy, and one had to be left behind about 40 miles from their final depot. The others reached Mount Hope on Jan. 26, 118 days after their trip started. The two men first afflicted with scurvy had to be hauled on sledges during the return trip and one, photographer Arnold Spencer-Smith, died March 9. All of the men had scurvy by then, as blizzards had reduced daily rations drastically, but a few days later they reached Hut Point. Their troubles were far from over, however. Their ship was gone and they were forced to live primarily off seal meat while staying in the frigid hut, originally built as a storehouse, not for long-term habitation. 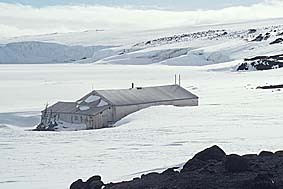 On May 8, Captain Aeneas Mackintosh and Victor Hayward decided to walk to a more comfortable hut at Cape Evans despite the fact it was too early in the season for solid sea ice. They were never seen again. Two days later a search party found evidence that the pair was carried out to sea on an ice floe. Finally, in March 1916, Aurora was able to break free from the ice that had trapped her for ten months and sail for New Zealand. She returned to the Ross Sea with Shackleton aboard, on January 10, 1917 to rescue the survivors. In total, three men had perished, a fact often overlooked in the lavish, praising reports of Shackleton’s exploits. Shackleton was so moved by the heroism and selfless devotion to duty of these men that he wrote in his memoir, South; "No more remarkable story of human endeavour has been revealed than the tale of that long march." The depots that cost them their lives, so meticulously laid, still lie beneath the snow to this day.